It is not unusual at one time or another when keeping a saltwater aquarium to find tiny microscopic-like white bugs swimming in your tank. What you are most likely seeing are copepods or amphipods. These tiny, shrimp-like crustaceans dwell in the substrate as adults, but during their larval and juvenile stages, these sea bugs are most often free-swimming through the tank water. Copepods and amphipods most often appear in closed aquarium systems after live sand or rock has been added. These sea bugs are both pelagic (free-swimming) and benthic (bottom-dwelling). Copepods occur in all types of aquatic ecosystems including freshwater, brackish, and marine. Amphipods are mostly found in marine ecosystems, but there are some freshwater and terrestrial species. Copepods and amphipods are just a few of the tiny animal organisms that make up zooplankton, which contributes to the makeup of plankton. These creatures eat phytoplankton (tiny plants and algae that also help make up plankton), small microzooplankton (zooplankton that is smaller than 1/127th of an inch in size), and detritus. Only a few of the thousands of species of copepods and amphipods known are carnivorous or parasitic, and these are rarely found in a saltwater aquarium system. For many saltwater fish and other marine species, copepods and amphipods are a primary food source, both in nature and in captivity. Because these tiny organisms are a natural part of the plankton food chain in the ocean, they are naturally going to occur in a saltwater aquarium environment. They are also micro-cultured as food for various species of adult marine animals, as well as used and tested as a food source in the research of culturing and rearing all kinds of tank-raised fry. 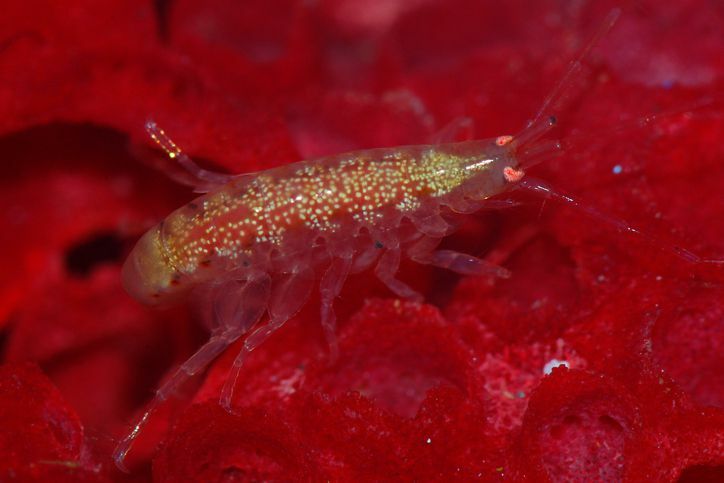 According to a breeder's registry database, copepods and amphipods are used as a food source when hatching and rearing gobies, seahorses, and octopus. Some fish rely on these sea bugs as their primary food such as mandarinfish (Synchiropus splendidus, ocellatus, picturatus, stellatus, and Dactylopus dactylopus), sand sifting gobies, and sleeper gobies (Valenciennea). Most of the saltwater fish listed that require or feed upon these sea bugs are challenging to keep, require a well-established aquarium with a heavy bug population or else they may starve, and these fish should not be kept with aggressive fish where they have to compete for food. They are not good fish for beginners or newly started aquariums. So what do you do if your aquarium does not have a good bug population present to sustain fish that require them and you don't want to wait around until one develops? There are a few suppliers where you can buy them. These can be introduced directly into an aquarium or micro-culture in another system, such as a refugium, and then harvested for feeding. You can also check out any local saltwater fish stores in your area, or browse livestock and aquarium product supplier's online stores to see if they carry these live food colonies. Some online stores you can try are two Hawaii-based companies, Indo-Pacific Sea Farms and Seahorse.com. Want to Get Rid of Them? Even though these sea bugs are considered a food source for some tank inhabitants, these organisms are considered a nuisance to others. Sometimes when very large populations of these bugs are present in the free-swimming larval and juvenile stages, you may see fish in the tank shaking or shuddering. This is because the bugs are crawling on the fish, causing an annoying tickling sensation. This can become overwhelming and exhausting for the fish because they find it difficult to get any rest as they constantly move or dart around to keep the bugs off. If this happens, and you are concerned about your fish, and you do not have any bug-eating animals present in the aquarium to help reduce their numbers naturally, it may be necessary to take steps to get rid of them. To do this, add a hang-on-tank type canister filter with a fine micron sleeve or pleat cartridge on the aquarium to filter the bugs out of the water for a short period of time. In most cases, these tiny bugs are a beneficial and natural part of a well-balanced aquarium ecosystem. They aren't hurting anything, and unless they are causing a big problem for the fish or other tank inhabitants, you shouldn't have to do anything about them. Once they grow to maturity, they will retire into the rocks and substrate of the aquarium.